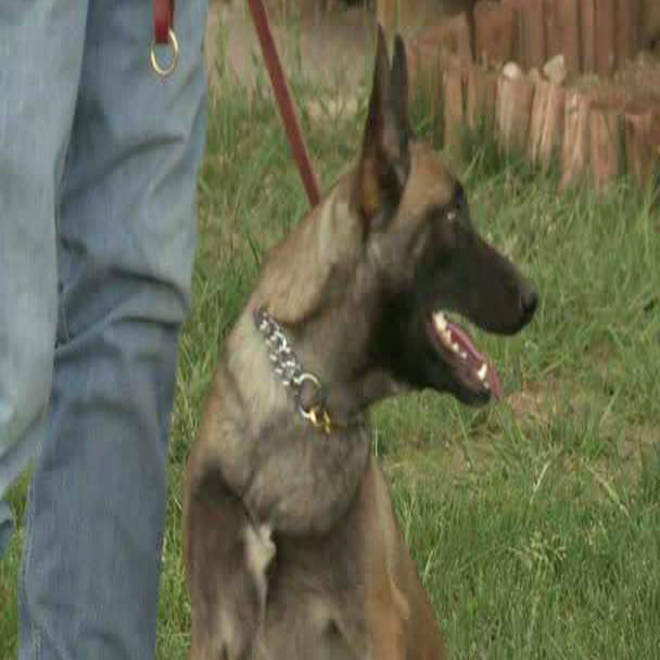 Nikka, a police dog in Vaughn, N.M., is now the town's only official member of the police force. VAUGHN, N.M.-- A drug-sniffing dog now is the only certified member of the police force in the small eastern New Mexico town of Vaughn. Police Chief Ernest "Chris" Armijo decided to step down Wednesday after news stories reported that he wasn't allowed to carry a gun because of his criminal background. "He decided the attention was distracting," said Dave Romero, an attorney for the town. According to NBC affiliate KOB.com in New Mexico, Armijo's annual salary is less than $30,000. Because he can't own a gun or any ammunition, he sold an assault rifle he owned to Guadalupe Sheriff's Deputy Juan Sanchez in January for $250, KOB.com reported. A second police officer in Vaughn, Brian Bernal, was hired in the spring, but he had his own legal problems: In January of 2011, Bernal pleaded guilty to assault and battery against a household member, which prohibits him from owning a firearm by federal law, KOB.com said. Now, according to records, the only qualified member of the Vaughn Police Department is Nikka, a drug-sniffing dog. Non-certified officers can't make arrests and can't carry firearms. 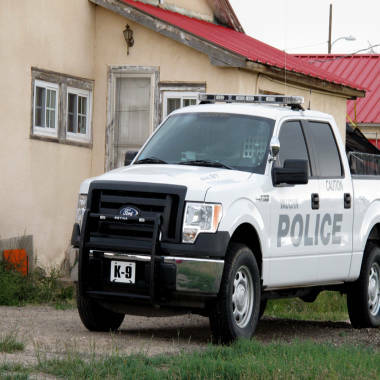 The K-9 police truck of the Vaughn, N.M. Police Department sits in the driveway of former Vaughn Police Chief Ernest "Chris" Armijo on Wednesday, Sept. 26. Vaughn, a town of about 450 located 104 miles east of Albuquerque, is a quiet place that is an overnight stop for railroad workers. While residents maintain there is no crime problem, the town is set deep in what U.S. officials say is an area popular with drug traffickers. The desolate roads in Guadalupe County make it hard for authorities to catch smugglers moving drugs from Mexico. Armijo told KOB.com in June that he didn't feel he needed a gun to do his job. “We have tasers, batons, mace … stuff like that,” Armijo said. "This isn't a TV show. This is life. We don't run in every day with a gun drawn. Life isn't in a pistol grip. It's how you talk to people. I wasn't the type of person to go, 'I'm a cop, now give me my badge and my chip on my shoulder.' That's not me."